I love grilled corn in the summer and was excited to try out this Rachael Ray recipe that took advantage of it. 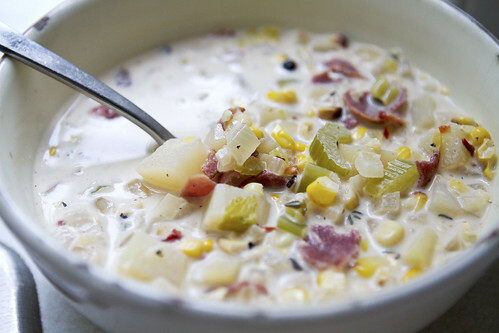 I have tried a similar recipe and loved it, but thought the addition of chipotle chiles sounds like a perfect combination with the corn and bacon in this creamy soup. It was super yummy! 1.Preheat a grill or broiler. Grill or broil the ears of corn until charred, 7 to 8 minutes (cover the grill to give the corn a smoky flavor). Scrape the kernels from the cob. 2. While the corn is charring, in a soup pot, heat a drizzle of EVOO over medium-high heat. Add the bacon and cook until crisp, 3 to 5 minutes. Using a slotted spoon, transfer the bacon to a plate. Add the onion, potatoes, celery and garlic to the pot. Add the bay leaf and thyme, season with salt and pepper, cover the pot and cook until the vegetables are softened, about 5 minutes. 3. Using a food processor, puree the chipotle chiles. Stir into the vegetables, then stir in the broth and bring to a boil. Lower the heat and keep warm. Rinse the food processor bowl. 4. Add one-third of the corn kernels to the food processor, pour in 2 cups of the soup and puree. Pour the mixture into the remaining soup and lower the heat to a simmer. Stir in the remaining corn kernels, the cream and reserved bacon and cook until thickened, about 2 minutes. Serve the chowder in bowls with the lime wedges, parsley, scallions and lots of cheese.